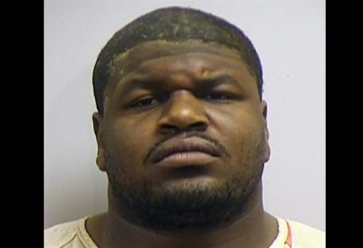 Dallas Cowboys defensive tackle Josh Brent was charged Saturday with intoxication manslaughter connected to the death of Cowboys practice-squad linebacker Jerry Brown Jr., Irving, Texas, police confirmed to NFL.com's Ian Rapoport. Irving police confirmed Brent is being processed on the charge, which is a second-degree felony punishable by two to 20 years of imprisonment and a fine of up to $10,000. Irving police spokesman John Argumaniz said Brent is being held without bond. Dallas Cowboys nose tackle Josh Brent faces an intoxicated manslaughter charge following a car crash which claimed the life of teammate Jerry Brown Jr. (Irving Police Department/) According to a report released by Irving police, Brent was behind the wheel of a car at 2:21 a.m. when it hit a curb, causing the vehicle to flip at least once before coming to rest in the middle of a service road. When officers arrived on the scene, Brent was responsive and able to speak. Brown, 25, was unresponsive and transferred to a local hospital, where he later was pronounced dead. Officers suspected alcohol played a role in the accident and had Brent perform field sobriety tests. Brent eventually was taken into custody. The charges were altered from driving while intoxicated to intoxicated manslaughter when police learned Brown had died as a result of injuries sustained in the accident.